What if viruses can alter our genetic code. What if a virus mutated our ape-ancestors’ DNA and we became smart. What if this virus has a dark side as well and can alter our DNA to devolve back into apes? But this virus isn’t like any other known virus, and it came from the Forbidden Fruit. The main characters of the “TIO” series books are Prescott, Claire and Travis. They possess paranormal ability and together they can cross into the realms of the death, the realm of the minds and of the souls. 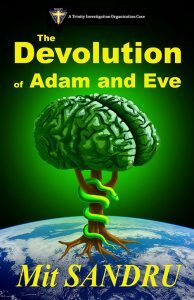 They are able to solve paranormal crimes where normal detectives and the science cannot as was the case in “The Pregnant Pope.” In “The Devolution of Adam and Eve” the pathogen responsible for devolving humanity is from another realm and only they can unravel what it is, who unleashed it on the humanity and be able to stop it before we go extinct. “Why do you suspect that Aaron’s Rod was offered for sale?” Travis asked. “Did you inquire about it?” Dr. Stark asked. “I think I’m missing something. You’re talking about the forbidden fruit offered for sale, but what does it have to do with Aaron’s Rod?” Prescott asked. “Sprouting leaves?” Dr. Stark asked. “Say what?” Dr. Stark shouted. “I got your attention, didn’t I?” smirked Dr. Klein. “Wait, wait—are you suggesting that Aaron’s Rod sprouted into the Tree of Knowledge and bore fruit, almonds, which are the forbidden fruit?” Travis asked. “That’s exactly what I’m saying,” said Dr. Klein. “Do you think the A&E Historical Society bought the forbidden fruit?” Claire asked.